The Big Blue Smokehouse in Hazard, Ky is known for its seasoned, slow-smoked ribs, and pulled pork, along with its barbecue nachos, smoky baked beans, and potato salad. Then there’s the large, fresh salad bar and desserts like Butterfinger pie and molten lava cake with ice cream. What began two years ago as a full-blown restaurant concept covering 4,500 square feet in a Hazard strip mall actually “started as a hobby in our back yard,” says Renee Neace, wife of Estill Neace and friend of Dougie and Jayne Campbell. The Campbells and Neaces are Perry County natives partnering in this thriving barbecue restaurant. Years ago, the Campbells began bringing their young daughters over to the Neaces’ home, where the children would play in the pool and the couples would hang out and cook. “We bought a small smoker and we’d buy Boston butts for pulled pork,” Renee recalls. Soon, they were being asked to cater dinners and company parties. Dougie Campbell, who owns a body shop, fabricated a larger smoker out of a 500-gallon fuel tank and the couples took their barbecue on the road, cooking for thousands who attend the annual Black Gold Festival, where Hazard celebrates the area and its coal-rich history, coal workers, and their families. They brought 1,200 pounds of pork the first time they set up for the three-day festival, and it lasted one day. “We didn’t know what we were doing,” Renee says. But 10 years of festival hopping taught the couples enough to try a restaurant. After operating briefly in Breathitt County, Big Blue Smokehouse moved to Perry County, where it now has a full-service bar and private dining area. Much of the meat served at the restaurant is purchased from the Chop Shop, a meat processing plant not far away in Wolfe County. “If we can buy a product from Kentucky, we do,” says Renee. 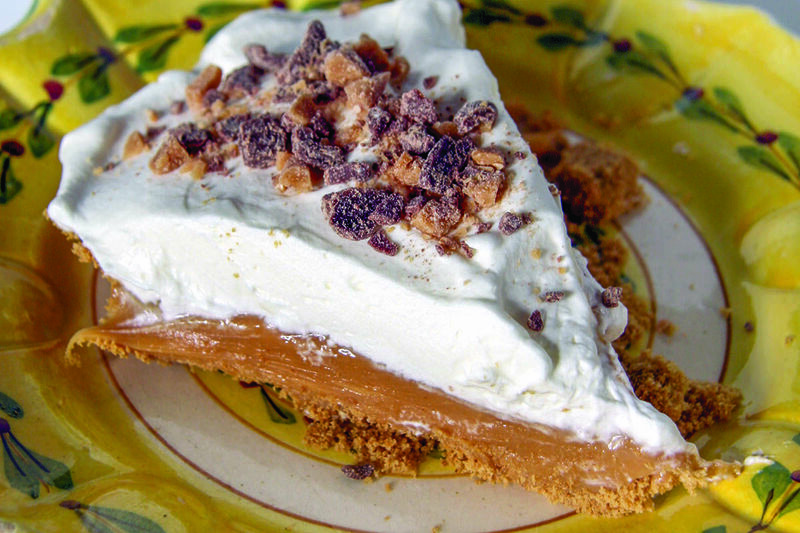 Caramel pie is among the restaurant’s most popular desserts. The recipe below comes from manager Geraldine Abner. While there are several ways to caramelize sweetened condensed milk, we prefer the slow-cooker method. For more information on the Big Blue Smokehouse at 123 Corporate Drive, Suite 101, Hazard, call (606) 487-1200 or go to thebigbluesmokehouse.